Coinciding with the partnership announcement today is the debut of National University’s interim signage on the Western Metal Supply Co. rooftop. The signage will remain in place until mid-season, when a new, iconic National University Picnic Terrace sign will be installed above the home and away bullpens. This will be one of the largest signs visible inside the seating bowl. So large, in fact, that the National University sign is actually larger than the Petco Park sign that adorned the old scoreboard in left field. Any time you have a supplemental advertisement that is both larger and brighter than the name of your freaking ballpark, you may be doing it wrong. What was interesting to me wasn’t the partnership with National University – the Padres used to have a partnership with Ashford University – or the fact that the Padres put up signage to support their latest sponsor, but that the cost to actually construct the National University sign actually cost the price the Padres paid. 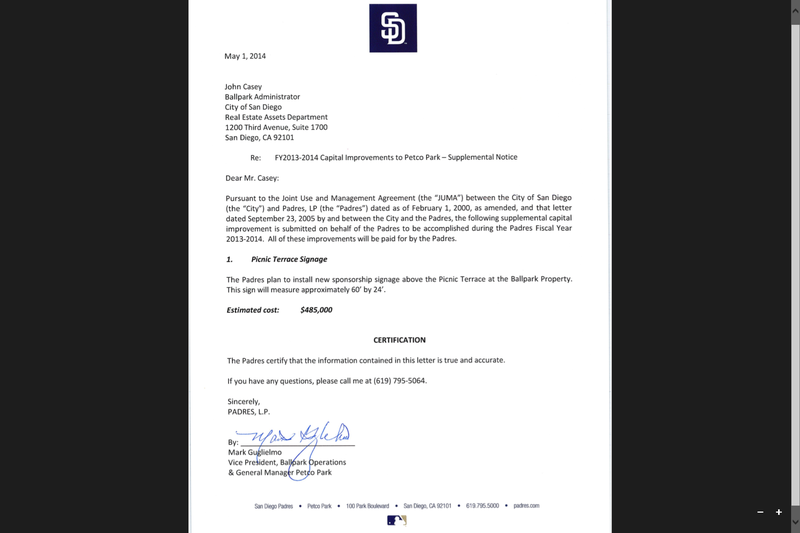 In a document from the Padres to the city of San Diego, acquired by Gwynntelligence, the cost is made crystal clear: $485,000. On the one hand, $485,000 doesn’t seem like a whole lot of money for baseball teams that waste $8 million on Josh Johnson. On the other hand, paying $485,000 for something unrelated to the Major League payroll is a substantial cost. Let me put this in perspective: the Padres paid considerably more in 2014 to construct the National University sign than they spent on “Field and landscape maintenance” ($185,750*), “Uniforms/the cost of uniform for year round cleaning staff, etc.” ($82,389), and promotional “Give Away Items” ($27,180) combined. The Padres second most touted international signing of the 2013-2014 international market was Elvis Zabalo, a young shortstop out of the Dominican Republic. Zabalo’s signing bonus? $500,000…basically one National University sign. Even more laughable perspective: the Padres spent over 100 times more on the sign than they did on “Press Dining” ($4,030) and over twenty times what they spent on “Employee Events” ($22,350). * – All numbers compared to proposed 2014 JBOE, as the actual JBOE has not been officially released. Look, I do get it. You pay some money to put up a sign and that sign, in turn, brings in additional revenue through the partnership. But are a few extra nickels down-the-road, after recovering the cost of the National University sign, really worth sullying the stadium with an advertisement that can only be described as a monstrosity? Weren’t there better ways to achieve the same ends? What is the revenue generated thru this cost? Rick – fair question. I don’t have the answer to that question, as there hasn’t been a press release from the Padres, or a similar document given to the city of San Diego, that would itemize the revenue in such a way. I imagine that (long term) the sign would be part of a profitable partnership for both sides, but I have no way of proving this. Did National University make a financial gift to the Padres in exchange for the sign? If so, their gift would have covered the cost of the sign plus provided additional revenue above and beyond that expense.